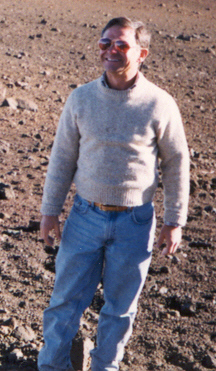 Dave Slater on Mauna Kea, Hawaii, during an observing run, circa 2000. Dave grew up in Los Angeles, where his dad worked in the aerospace industry, including time in project Apollo. Dave was intensely interested in astronomy as a boy, and grew up determined to become a scientist. After earning undergraduate and master’s degrees in physics, Dave was commissioned as an officer in the U.S. Air Force, where he worked on a series of aircraft and spacecraft projects during technical assignments as an officer in Space Division in L.A. and Wright-Patterson Air Force Base in Ohio. Dave then applied for and received permission to earn his Ph.D. while still in the Air Force; he was accepted into the Ph.D. program at Stanford University, where he specialized in engineering physics and the construction of ultraviolet optics and detectors for solar physics missions. Dave joined the Southwest Research Institute (SwRI) in August 1993 as a post-doctoral researcher, immediately after earning his Ph.D.
At SwRI, Dave’s work focused on detector physics and instrumentation, space science, solar physics and planetary atmospheres. He was the project scientist and lead optical engineer for a wide range of spectrographic instruments including three planetary and solar physics sounding rocket instruments; a space shuttle payload; Rosetta-ALICE on ESA’s Rosetta comet orbiter spacecraft; the Alice instrument flying on the New Horizons spacecraft to Pluto and the Kuiper Belt; the LAMP (Lyman Alpha Mapping Project) on the Lunar Reconnaissance Orbiter mission; and the Juno-UVS for the Juno mission to Jupiter. Dave also took part in a large number of SwRI internal research projects, including one that took him to the South Pole with me in 1996. Dave was part of New Horizons from its inception. In fact, he worked on instruments for Pluto missions for over seven years before New Horizons even came into being. Much of what we will learn about Pluto's atmosphere when New Horizons arrives at Pluto in 2015 would not have been possible without Dave's work. 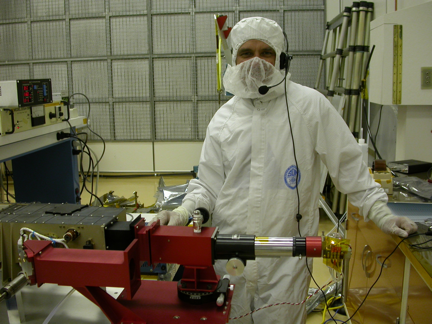 Dave during testing and calibration of an Alice ultraviolet spectrograph at the Johns Hopkins Applied Physics Laboratory, 2005. Dave was intensely family oriented, an athletic long distance runner, and loved the outdoors. I traveled and worked with Dave extensively from 1993 to 2007, to nearly every continent on Earth, to countless scientific and engineering meetings, to nine launch campaigns, a solar eclipse, and the South Pole. He was, without a doubt, the cheeriest individual I, and I think many people, have ever worked with. 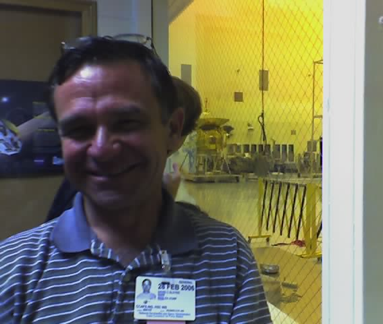 Dave in late 2005, outside the cleanroom where New Horizons was undergoing final preparations for launch from Cape Canaveral, Florida. In May 2007, Dave learned he had malignant brain cancer. Despite all odds, most giving him a year or less to live, he resolved to persevere, continuing his work and continuing to raise his sons as he always had. Despite brain surgeries, intense radiation and debilitating biweekly chemo treatments, Dave’s personality was forever sunny, and his drive to see his younger sons grow to be men was resolute. Against all odds, Dave survived for four years and was rewarded to see his sons reach early manhood. Beyond his contributions to New Horizons and other space ultraviolet projects, Dave’s contributions to SwRI’s development as a leading institution in the space sciences were fundamental. Few people realize just how important a role he played in that success, but nearly everyone remembers what a joy he was to work with and to travel with, and what a better place he made the workplace every day. Dave is survived by his wonderful wife, Susan; his mother and two sisters; and three fine sons—twins Marc and Matthew, and their older brother Michael. On behalf of everyone who knew him on the New Horizons project, I’ll close by saying that we miss Dave’s deep expertise, his boundless energy, his wide smile and his infectious personality, every single day.